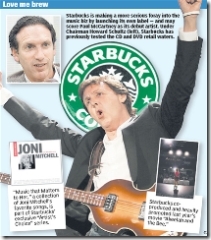 Starbucks has announced that Paul McCartney will become the first artist to release a record on the company's newly formed Hear Music record label. The record, which is scheduled for an early summer release, will be McCartney's first studio release of all-new material since 2005's Chaos and Creation in the Backyard. Starbucks made the announcement today (March 21) at its annual shareholders' meeting in Seattle. Starbucks has sold CDs in its stores under the Hear Music brand since acquiring the company in 1999. Among its most successful albums are Ray Charles' Genius Loves Company and Sergio Mendes' Timeless. Hear Music also has its own station on XM Radio. Previously, Hear Music CDs were sold only in Starbucks stores and specialty-branded retail outlets, but the McCartney CD will be the first album to be released since Starbucks and the Concord Music Group evolved Hear Music into a true record label that will sign and develop artists and distribute their recordings through traditional music channels. South Korea, a key donor, stopped aid after the North fired a series of missiles in July, and supplies from China, the North's main foreign food donor, are one-third of last year's levels, said Mike Huggins, a WFP spokesman who just returned from a five-day visit to North Korea. The United States also has stopped donating to the WFP's North Korea operations, but says it will continue other food aid to the North. The aid shortages come on top of the North's decision to accept less food from the World Food Program. A decision that means about 4 million people fewer are being fed this year, Huggins said. Some 37 percent of North Korea's children are malnourished and one-third of mothers are malnourished and anemic, he said. Huggins said those figures were likely to "look even more alarming" if more aid is not delivered soon. North Korea's grain harvests should show a shortfall of about 800,000 tons this year, Huggins said. He said WFP will donate about 75,000 tons, or less than 10 percent of the shortfall. Jiyugaoka is still one of the preferred residential and shopping areas for the well-heeled spawn of Tokyo's old-school money. By day, fancy patisseries with French names and sleek fashion boutiques cater to young ladies from well-to-do families out browsing for tea and cakes or designer clothes. By night, dozens of restaurants and bars offer a smorgasbord of food and drink to young couples. It is international, eclectic and, as a rule, expensive. But a stone's throw away from the station's main exit, hugging the side of the Toyoko Line tracks, is a somewhat ramshackle multitiered building called Jiyugaoka Depato. Though depato is short for department store, it isn't what you might think, especially in this area: The ground-floor houses an arcade of small individual shops selling everything from home appliances to thermal underwear, while the upper floors house an equally unpretentious collection of restaurants and bars. Jiyugaoka Depato seems oddly out of place in an otherwise upmarket neighborhood. But Le Carre Blanc, the building's latest and most popular drinking spot, seems right at home. In less than six months, Christofer Cousin, the bar's creator and master, has managed to amass a steady client base, including every party-oriented expat in the greater Meguro area. Some patrons even come out from the city to party at Le Carre, which is no mean feat for a bar hidden away on the third floor in the suburbs. How, you might ask, has a French native with barely four years in Japan, managed to walk into one of the city's best neighborhoods and open a hopping little night spot? "I used to go out drinking and clubbing every chance I could when I first got here," says Chris, as he prefers to be called. On first arriving, he worked at Jiyugaoka's Irish pub, Ocarolan's, for three years. During that time, his natural ability to meet and bring people together was given full play. He further nurtured his network of friends in the area by hosting regular parties at another local haunt, Bar 320. He recruited DJs and put the word out, and once a month or so an otherwise quiet bar would be pumping with music and party people. "It was like a private members party for people who lived in the area," says Chris. "And it attracted a truly mixed crowd -- young and old, Japanese and foreign." His parties were so popular that Bar 320 owner Mitsuhiro Kuwano backed him in opening his own place. And, six months down the road, they couldn't be happier with the result -- except that Chris doesn't get to go out bar-hopping and clubbing as much as he would like. The vibe on Friday and Saturday nights is electric. Both fresh-faced and seasoned drinkers crowd in at the 10-stool counter, with emphasis on the word crowd. But it is a friendly crew of partiers with whom you will rub shoulders -- and invariably meet -- as you maneuver to order drinks. But with no cover charge and all drinks 500 yen, it's no wonder that everyone is all smiles. Other days of the week, the interior feels larger. And, with all white walls, ceilings and fixtures, including the bar, it looks quite clean and sane, especially considering the beating it gets on the weekends. A few cushions sit in a curtained corner at the end of the bar, in front of which is placed an elegantly crafted water pipe. But it is not just for show. Chris also stocks a full range of fruit-cured tobacco from you can choose a flavor and light up. This Middle Eastern theme is further accented by a belly dancer who comes to tease the crowd (usually every other Saturday night -- next on April 29) just to get the party started. Someone -- usually a girl -- ends up with a decorative Indian bidi stuck on the forehead. The crowd is an even mix of Japanese and foreigners; pub types and clubbers. 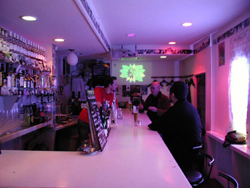 The music is as varied as the clientele, with everything from funk to trance given equal play. One patron turned to me one night and asked where he could find a similar bar in the city. I was stumped. The truth is that Le Carre Blanc is unique. There isn't anywhere else like it in Tokyo. So if you're into some serious fun I suggest you catch a Tokyu Toyoko train out to Jiyugaoka one night . . . Le Carre Blanc; Jiyugaoka Depato, 3F, 1-28-8-3 Jiyugaoka, Meguro-ku, Tokyo; (03) 3723-9333. Open 6 p.m.-2 p.m. Tuesday-Thursday, later on weekends. Closed Monday. No cover charge. All drinks (except top shelf) 500 yen. The violations occurred during a 17-month period, from January 2004 to May 2005. The Tyson beef plant in Wallula, Walla Walla County, received four "noncompliance records." Documents say the plant failed to identify and mark cattle older than 30 months, and in one case mixed edible beef parts with spinal columns and other parts from older cattle. Inspectors also spotted meat contaminated with spinal cord and a worker who failed to sterilize his knife after cutting tonsils, which can carry the infection. Walt's Wholesale Meats in Woodland, Cowlitz County, was cited for failing to sanitize equipment after processing spinal cords and heads from older animals. 1. Plant employees are not correctly identifying and marking all heads and carcasses of animals over 30 months old. Therefore, plant employees and government personnel further down the line are unaware that numerous parts should be removed as SRMs and these high risk materials are entering the food supply. 2. On line inspectors are not authorized to take actions when they see plant employees sending products that do not meet export requirements past the point on the line where they can be identified and removed. WASHINGTON (AP) -- Tests have confirmed mad cow disease in a U.S. cow previously cleared of having the brain wasting illness, the Agriculture Department said Friday. It is the second case of mad cow disease in the United States. Human health was not at risk, Agriculture Secretary Mike Johanns said. The animal was a "downer," meaning it was unable to walk. Such animals are banned from the food supply. An internationally recognized laboratory in Weybridge, England, confirmed the case of mad cow disease after U.S. tests produced conflicting results, Johanns said. New tests were ordered two weeks ago. Those results came back positive, leading officials to seek confirmation from the Weybridge lab. The department also performed more tests at its lab in Ames, Iowa. The first case confirmed in the U.S. was in December 2003, a dairy cow imported from Canada. "I am encouraged that our interlocking safeguards are working exactly as intended," Johanns said. "This animal was blocked from entering the food supply because of the firewalls we have in place. Americans have every reason to continue to be confident in the safety of our beef," he said.